This artfully crafted cushion is a unique piece in a 40x60 rectangular format that sets the stage on your sofa. The silk and satin blend in delicate shades of clay grey, black and white add an elegant, soothing touch to your interior. 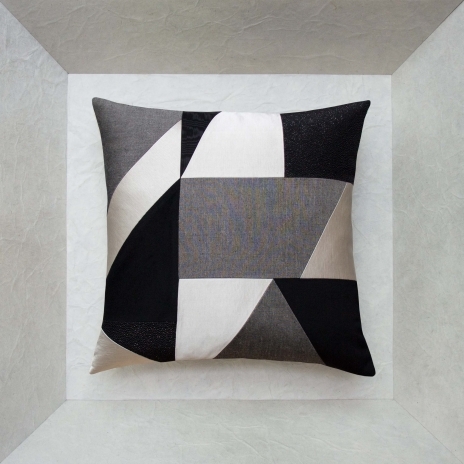 The harmonious combination of materials with random geometric patterns gives it a elegant, dynamic design that will add a precious look to your sofa and armchairs. On the front, white wool fabric, clay grey polyester and cotton satin, black cotton ottoman and black silk. Black silk and polyester ottoman, zipper covered with black grosgrain ribbon, green metallic leather tab, silver grommets.